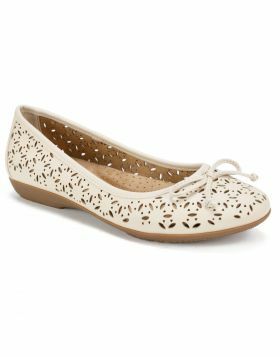 The distressed upper of the Carrie casual ballet flat from Cliffs Shoes by White Mountain will add some flair to your everyday style. Featuring a soft memory foam cushioned insole, perforated arch support pad, and a flexible outsole, these stylish flats define comfort. The distressed upper of the Carrie casual ballet flat from Cliffs Shoes by White Mountain will add some flair to your everyday style. Featuring a soft memory foam cushioned insole, perforated arch support pad, and a flexible outsole, these stylish flats define comfort. Heel height: 3/4 inch.